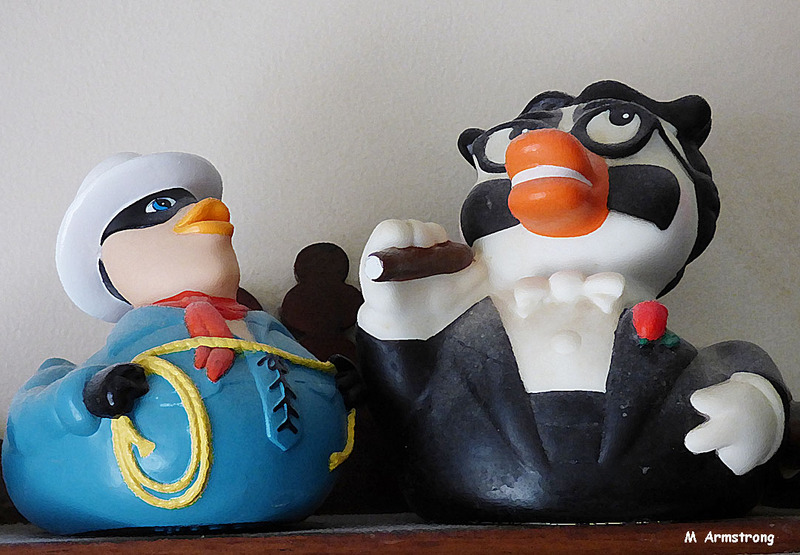 Celebriducks are the most intentionally whimsical toys in the world. Not only do they float in your tub, but because of their weight distribution, they tend to float upside down. Since few of us actually bathe with a rubber ducky, it doesn’t really matter. I guess. Before the dogs totally destroyed ALL their toys — and there were a lot of them — they were surprisingly whimsical. Now, they are rags and bits of scrap fabric. The dogs sure like their toys. I love whimsy! It’s delightful fun 🙂 Great photos! We have learned to not get our dog a toy with a squeaker in it. It doesn’t matter if it’s supposed to last two hours or two months, within about two minutes, that thing is shredded and the squeaker has been destroyed. 🙂 I have several of those ducks and have never bathed with them. They just hang around and look cute. 🙂 Thanks for the chuckle and for joining the challenge!